DENVER -- Teachers in the state's largest school district could go on strike after Denver Public Schools and the teachers union failed to come to an agreement. 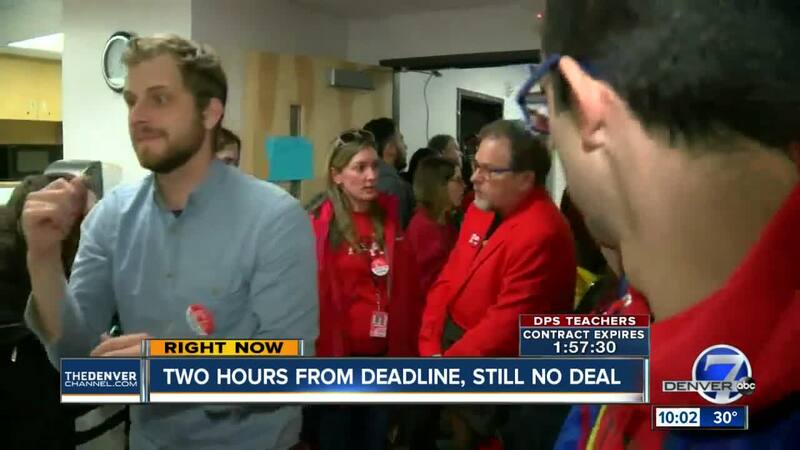 The Denver Classroom Teachers Association (DCTA) ended negotiations at 10:30 p.m. Friday before the midnight deadline. After a month of negotiations, the two sides remain about $8 million apart. Neither side would budge on salaries but made compromises to the expiration of the contract and professional development units. Both sides appeared visibly exhausted and stressed during Friday's negotiations. Denver Public Schools wanted to continue to negotiate and said they had steadily come up on their original offer. However, teachers did not budge Friday on asking for $31 million. Many teachers say they cannot afford to live in Denver anymore. “I could leave today and go to Boulder and get a $20,000 increase with my experience and education," said Lisa Yemma, a Denver teacher with over 16 years of experience. Teachers say a possible strike isn't just about salaries, but a social justice issue as more and more teachers quit to work in better-paying districts. "There becomes a point when of course the fight is worth it. When we see that our best teachers are leaving a majority of student of color districts. They are leaving to go to more affluent districts. We see this as a social justice issue," said Sean Davis, a DPS special education teacher. Teachers will vote on whether or not to strike Saturday and Tuesday. A strike could begin on Jan. 28, at the earliest, if the union votes to proceed. Susana Cordova, the DPS Superintendent, has previously said that should the union vote to strike, the district would immediately ask the state to intervene. She has also said in the past that should teachers walk out of the classroom, she would call on substitute teachers and licensed employees within the district to take over classrooms.